The Taste of Fort Collins is a Northern Colorado Tradition – a community celebration with family-friendly activities that are perfect for Northern Coloradans’ active lifestyle. Taste of Fort Collins continues to benefit the Eyeopeners Kiwanis Club of Fort Collins Foundation in its charitable activities in the community. This three-day festival offers attendees food from local and national restaurants, entertainment from regionally and internationally acclaimed musicians, and an eclectic display of fine artisans work as well as the region’s best crafters. Where is Taste of Fort Collins located? Intersection of LaPorte Ave. and Mason St.
Intersection of LaPorte Ave. and Meldrum St.
What are the festival ground rules? Alcoholic beverages, glass bottles, coolers, picnic baskets, carry-ins of any type (all backpacks or large bags will be searched upon entry). Refillable water bottles must be emptied upon entry. Drugs or paraphernalia, including cannabis products of any kind. Kites, Frisbees, balls, or other sports equipment. Scooters, skateboards, or inline skates. Firearms, weapons, contraband, or laser pointers. Bicycles (please use the bike racks at the Festival entrances). Drink responsibly and make sure your group has a designated driver. This is a family festival. Please remember to use appropriate behavior and refrain from inappropriate language. Have a meeting place in case you get separated. Get comfy – feel free to bring blankets and lawn chairs for the grass to watch the awesome local and national talent. No alcoholic beverages may be taken off festival grounds. Please dispose of recyclables and trash in the proper receptacles and help us leave the neighborhood clean. Why is there a gate admission? Parking is available on the surrounding streets and in garages, however, we recommend carpooling and riding bikes to the festival. The Downtown parking structures offer special pricing on Saturday, June 8 – $5 all day (no hourly rate). The parking structures are free on Sundays. More info at fcgov.com/parking. Yes! MAX is operating until midnight on Friday and Saturday, and offering special Sunday service during the Taste from 10 am – 10 pm Transfort is adding more buses to the route with higher frequency. More info at ridetransfort.com. Where is information, First Aid and Lost & Found? UC Health provides first aid and ambulance services at the Taste of Fort Collins. First Aid services are located next to the Volunteer tent on LaPorte Ave, next to the County Building. The Lost & Found – including lost children – is located at the Volunteer tent. At the North Entrance at the corner of Mason & Meldrum. Where are permitted smoking areas on the festival grounds? 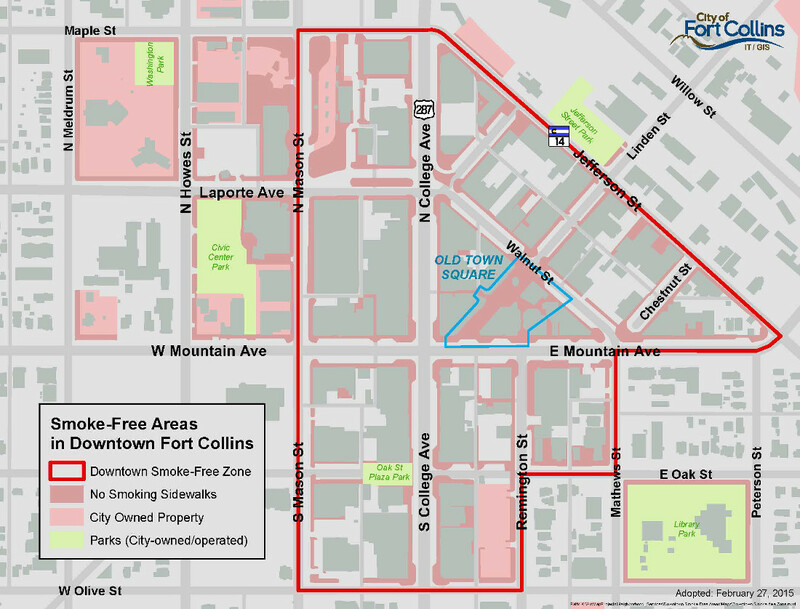 Please be aware of the Fort Collins City Council Smoking Restrictions in public areas. View the map for information. Please note that the use of electronic smoking devices will be prohibited in all places where conventional smoking is not allowed. Will our local neighboring businesses will remain open? St. Joseph Catholic Church – access via Mountain Ave. Parking lot access via Howes St. by way of open lane on west side of street (yes, you may go around the Road Closed sign). Mountain Cafe – access via Mountain Ave. If you’re interested in joining the team, click here to fill out an application. Still have questions? Click here to contact us directly and we’ll get back to you as soon as possible. © 2018 A Townsquare Media Event.